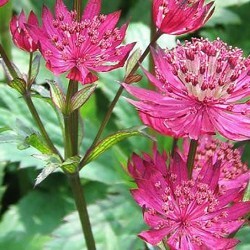 Astrantia There are 2 products. Masterwort the first to bloom in our gardens. Beautiful bronze green foliage. Ruby abundant and long blooming. A prune after flowering for a second flowering in september-october. Humus-rich soil, fresh. 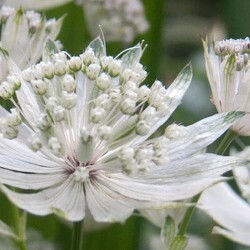 Great variety astrantia close to major, but with very large flowers, pure white, soft green streaked widely. To install nearly a passage enjoy. Sol fees drained. Good flower bouquets.